Egyptian schoolboy Mina Habib rarely leaves his house these days. The 10-year-old is still recovering from seeing Islamist gunmen kill his father for being Christian. In an attack claimed by Islamic State, gunmen ambushed a group of Coptic Christians travelling to a monastery in Minya in southern Egypt last month, killing 29 and wounding 24, with Mina’s father Adel among the dead. A month later, residents of Dayr Jarnous, a Christian village that was home to seven of those killed, say the government is not providing proper security and has done nothing to help the victims’ families. Mina is receiving therapy at a local church, in the absence of any treatment from the government. His brother Marco, 14, who also escaped the attack, visits a monastery to read the bible as a form of therapy. Still shaken, village residents fear they are exposed if there is another attack and want President Abdel Fattah al-Sisi to keep his promise to protect Christians. There was no extra security in the village, with only a police point out in the desert where the attack took place. In one of the first detailed eyewitness accounts of the Minya attack, which has led to retaliatory Egyptian air strikes in Libya, Mina told Reuters it was pure chance that he and Marco were spared. They were on a pickup truck headed to the monastery of Saint Samuel the Confessor when the militants stopped them. Ahead, blood-soaked bodies littered the desert road to the monastery and two vehicles had clearly been attacked. “We saw dead people, just dumped on the ground,” Mina recounted. Mina said there were around 15 gunmen. He does not know why he and Marco were spared when other children were shot. Three vehicles were attacked. A bus and a car taking children and families to the monastery were the first targets. The gunmen shot out the windows then killed all the men and fired at the feet of the women and children. They took the women’s gold jewellery, eyewitnesses said. Some children were killed. When one of the gunmen’s vehicles had a flat tire, they stopped Adel Habib’s truck, which was carrying Christian workers, shot them and took the truck. Marco stopped a car when the militants left and put Mina in it to get him to safety. When at last he got mobile phone reception on the desert road, Marco called their mother. Now she keeps her children at home – neighbours have written “Marco and Mina the lion-hearted” on its walls – only letting the boys out for therapy in church. Marco was unavailable for interview; he was at a monastery reading the bible. “Ever since the accident I am always at home,” said Mina. “Security, the government, and the army are negligent. No one protects us other than God. It is known that Christians are not protected in this country,” said Kirolos Ishak, a university student whose father was also killed that day. 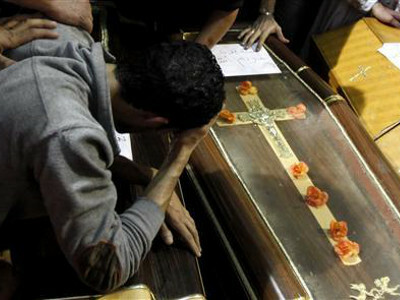 Coptic Christians, who make up 10 percent of Egypt’s population of 92 million, say they have been persecuted for years. In recent months attacks have increased, leaving about 100 dead. Egypt’s Copts support Sisi, who has vowed to crush Islamist militants and protect Christians. He declared a three-month state of emergency after church bombings in April. But many Christians feel the state is failing to protect them.